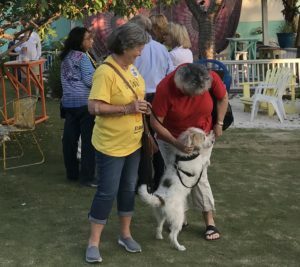 Two and four-legged solar supporters come together to celebrate in the Upper Keys. We swapped solar production graphs and savings stories. We toasted the hard work of our partners and volunteers. We laughed and learned through solar trivia. These are some of the festivities of a solar co-op celebration and the Sunshine State started 2019 with lots of stellar fun! Over the past month we’ve celebrated with five different solar co-ops, from the Upper Keys to the Panhandle. These celebrations are local and grassroots, like the solar co-ops that precede them. Some occur at a neighbor’s house, some feature a donation to a local charity, others are at a solar-powered brewery. All are community gatherings for the growing solar movement where we unwind, share hopes, and a toast Florida solar. We closed the quarter in the Sunshine City of St Petersburg, home of the Solar United Neighbors’ first Florida co-op in 2016. This party wrapped three highly successful co-ops into an All Seasons Solar Bash, celebrating 145 homeowners who installed solar and the many friendships built through the process. New and prospective solar homeowners, champion volunteers and installers mingled with committed municipal leaders who supported the work. “Parties provide community leaders firsthand feedback from the citizens and businesses impacted by their policies,” said Julia Herbst, who facilitated the Manatee and St Petersburg groups. St. Pete Mayor Rick Kriseman recognized the strength of the teamwork with a celebratory post to Solar in St Pete. If you were a part of the Citrus, Highlands, Orange County East or Orange County West Solar Co-ops your party is on the horizon, cheers!